In popular culture the term sniper has come to mean anyone who uses a rifle on another person from any but the shortest distance. Murderers who use rifles against civilians, such as the beltway sniper, John Allen Muhammad, have come to be known as well. In truth, only trained professionals that have undergone training in a sniper scout program, such as the United States Marine Corps Sniper Scout School, and have learned to use camouflage ghillie suits and stalking skills are actual snipers. 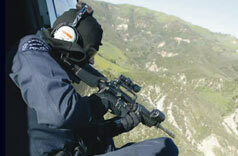 Police marksmen and sharp shooters are often incorrectly called snipers. These specially trained units are deployed only in extreme emergencies and hostage situations. Police snipers never shoot to incapacitate. They only shoot to kill. Police snipers are also never employed against material targets, only in situations where life is in danger. Police snipers also make their shots from much shorter distances than the long distances employed by marine and army snipers. During the 1972 summer olympic games in Munich, a palestinian terrorist group known as Black September raided the olympic village, taking the Israeli olympic team hostage. Because Germany's constitution forbids it, the German military could not get involved in what was considered a domestic matter. In an attempt to save the Israeli athletes, untrained German policemen were given sniper rifles. In the botched rescue attempt that followed, all eleven of the athletes were killed. The German government then established a police level branch sharpshooter task force to handle similar situations in the future. The branch was named Grenzschutzgruppe 9, or GSG9 for short. Today this group is considered the finest and most well trained of it's kind in the entire world.